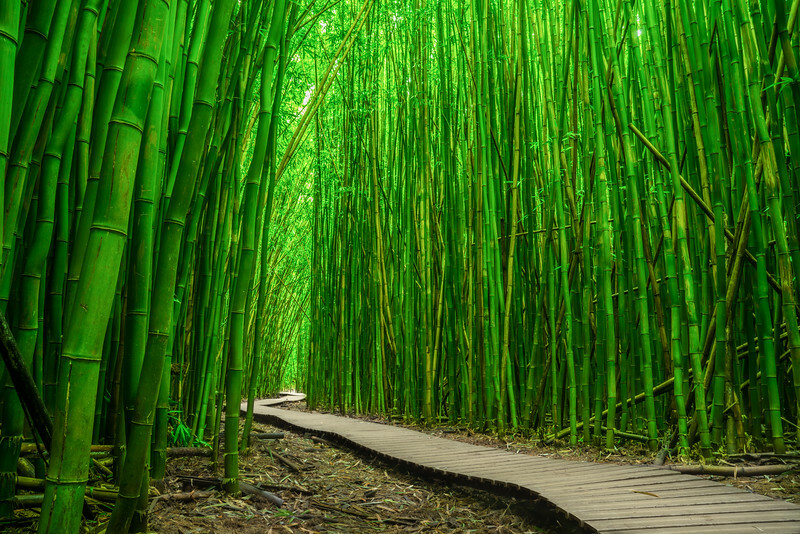 The picture shows an old and mystical bamboo forest, that you pass in the last third of the 1.8 miles long Pipiwai Trail up to Waimoku Falls. The trail is located close to Hana, one of the “Must See’s” is Maui. Not so much because of the laid back town Hana itself, but (a) because of the famous scenic coast highway to Hana and (b) because of Pipiwai stream and Oheo Gulch. Oheo Gulch is located just a few miles north of Hana. It was formed by the Pipiwai stream that is fed high up in the rainforest of Haleakala National Park. The stream finds its way downhill over countless waterfalls. The most impressive of those falls is Waimoku Falls, with 400 foot or 120 meter the highest of all waterfalls in Maui. Waimoku Falls can be reached at the end of the 1.8 miles long Pipiwai Trail.